Think about the haunting lyrics and images of Akon's "Ghetto" when making your New Year resolutions. We know in our hearts as Americans and as human beings that we can--and must--do better. Peace. A gene known to give many Jewish women a high risk of cancer also puts many Hispanic women at high risk, U.S. researchers said on Tuesday. They found that 3.5 percent of Hispanic women entered in a Northern California breast cancer registry had the BRCA1 genetic mutation, compared to 8.3 percent of Ashkenazic Jews and 2.2 percent of non-Ashkenazic white women. U.S. Senator Hillary Clinton's Web site includes veterans, children and women among her top issues. John Edwards' site lists blacks, Asian-Americans, Pacific Islanders, Latinos, the elderly and young people among his concerns. U.S. Senator Barack Obama talks about all of the above, but of the three front-running Democratic presidential candidates, he's the only one with a permanent place on his Web site for America's indigenous peoples. ''First Americans for Obama is a community of people dedicated to bringing positive change to American politics and breaking the cycle of partisan ideology,'' according to the First Americans for Obama page on his Web site. Electing Senator Clinton as president would be like rolling the dice twice–not only would we get the Senator but we would also get former president Bill Clinton. In the last few weeks, Senator Clinton’s campaign has upped the ante on nastiness. We are all for a vigorous contest for the Democratic party’s nomination for presidential candidate. That’s how it should be. The person that occupies the White House is President of the entire world. Look at how George W. Bush has ruined the world. Two months ago, when Senator Barack Obama was trailing by double digits in Iowa, where the first Caucuses will be held, he was seen as a spent force. Everywhere, Senator Hillary Clinton was being referred to as a “prohibitive” candidate. Then Senator Clinton started shooting herself on the foot. Before millions of television viewers, she appeared to epitomize double-speak when she was asked whether she supported New York governor Eliot Spitzer’s proposal –now abandoned—to give undocumented immigrants driver’s licenses. She answered in the affirmative and in the negative within a period of minutes. Senator Obama and candidate John Edwards were as astonished as the national audience and attacked Senator Clinton’s performance. It was thereafter that Senator Clinton's campaign took off the gloves. To begin with, Obama was not as unambitious, as he makes out to be and has always had an eye on the White House. The proof? The good senator from New York's campaign referred to an “essay” Obama wrote before he was even in grade school—while he was in kindergarten. Predictably, Senator Clinton became the object of jokes and ridicule. So the Clinton campaign decided to use the race card. A senior campaign official, Billy Shaheen, the co-chairman of Hillary Clinton’s campaign in New Hampshire, warned voters that Obama might not be the suitable candidate because were he to win the Democratic nomination, those nasty Republicans could bring up the fact that Obama has admitted to using marijuana and cocaine in his youth. Might the Republicans not even ask whether Obama had also been a drug dealer? This was clearly playing to the deep seated stereotype that some white people harbor—of Blacks as natural born criminals and drug dealers. Notwithstanding the fact that most of the means of shipping drugs into this country –the private and official planes, the air strips and airports, and the foreign connections, and officials approving entry into the United States— are not controlled by Black people. Although Senator Clinton apologized for Shaheen’s comments, and the official resigned, it is hard to believe that his comments could have been pulled from thin air. We wonder what else is in the playbook. The racist onslaught continued this past Sunday when former Nebraska Senator Bob Kerrey, pretending that he was praising Obama said he hoped Obama would play a role in a Clinton Administration by reaching out to Black youth and Muslims around the world. Kerrey added: "It's probably not something that appeals to him, but I like the fact that his name is Barack Hussein Obama, and that his father was a Muslim and that his paternal grandmother is a Muslim," Kerrey, who is currently president of the New School in New York City, said. "There's a billion people on the planet that are Muslims, and I think that experience is a big deal." As in the earlier case, Kerrey also issued an apology to Obama. Yet, in reading his comments, does anyone really believe this was not pre-meditated and malicious and in fact, racist by suggesting, in essence, that Obama is only sufficient in reaching out to Black youth and Muslims? Obama is a decent man. That is why he now leads Clinton in Iowa. And if the Clinton acolytes continue with such racist attacks, the lead should increase. If he was a dirty player, one of his officials might have responded in kind that those “nasty” Republicans might also ask Senator Clinton some embarrassing questions. If elected president, what assurances would voters have that there would be no more Monica Lewinskys in the White House? After all, these “nasty” Republicans are always talking about “family values” and what not. Bill Clinton in a television interview last Friday said electing Obama would be like rolling a dice. If Obama was nasty he could have said electing Senator Clinton would be like rolling the dice twice. Senator Clinton and Senator Obama may both be equally prepared to be President of the United States. Both are intelligent enough. Voters will judge each by their temperament and favor the one who conducts the better campaign. Message to the Clintons: Warn campaign officials not to play with fire. Sometimes it is impossible to control or direct the flames. Washington D.C. – Lakota Sioux Indian representatives declared sovereign nation status today (December 19, 2007) in Washington D.C. following Monday’s withdrawal from all previously signed treaties with the United States Government. The withdrawal, hand delivered to Daniel Turner, Deputy Director of Public Liaison at the State Department, immediately and irrevocably ends all agreements between the Lakota Sioux Nation of Indians and the United States Government outlined in the 1851 and 1868 Treaties at Fort Larami e Wyoming. We are the freedom loving Lakota from the Sioux Indian reservations of Nebraska, North Dakota, South Dakota and Montana who have suffered from cultural and physical genocide in the colonial apartheid system we have been forced to live under. We are in Washington DC to withdraw from the constitutionally mandated treaties to become a free and independent country. We are alerting the Family of Nations we have now reassumed our freedom and independence with the backing of Natural, International, and United States law. For more information, please visit our new website at http://www.lakotafreedom.com/. Senators Barack Obama and John McCain in tomorrow's paper. This spells bad news for Hillary and Romney. Bad for Romney because his state's most prominent newspaper is giving him a thumbs down. And horrific news for Hillary because a major liberal newspaper from the bluest part of the country prefers her opponent. Stunning U.S. Latina actress Jessica Alba is pregnant. The bebe is due in late spring. BTW: Walls can't stop the babies. 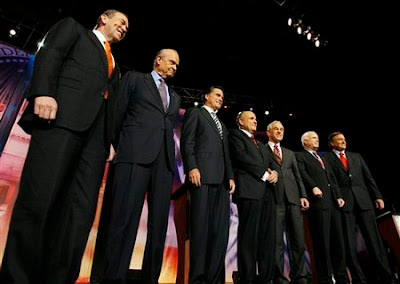 I missed today's Univision Republican Debate, so no post-debate commentary from me. Instead, I offer La bloguera's take as posted on the South Florida-based Adventures of the Coconut Caucus weblog, a site which proudly claims to put "the PANIC in Hispanic." La Bloguera's comments are hilarious. Yes it is that time again another Univision Spanglish debate!!!!! AND just like last time, the questions are asked in Spanish, translated to English, then the candidates speak English and are translated into Spanish by anonymous male voices. AND now our first audio glitch… with Giuliani…. and he has the voice of a a gay puertorrican!!!! OK, people i am completely bilingual, and I can´t understand WTF they are saying!!!! they are all saying they love immigrants and want to deport them at the same time, and we are a country of laws, and protect the border and let immigrants in…… NO ENTIENDO un carajo!!!!! OK everybody we are in MIAMI so we have to ask about Hugo Chávez…. and the audience totally boooos Ron Paul says we should talk to Chávez and then all travel to Cuba!!! !, most fun so far!!!! Finally Irak, and so far according to all the candidates we are winning!!!! Until of course Ron Paul, bring the troops home!!! and he actually gets some of his applause back. On to health care…. over an hour, how long is this thing anyway???? now unto education…. they are all in favor…. and it is over!!!! Al fin!!!! 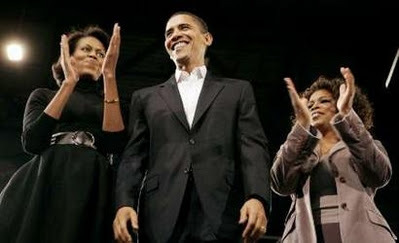 Michelle, Barack & Oprah! 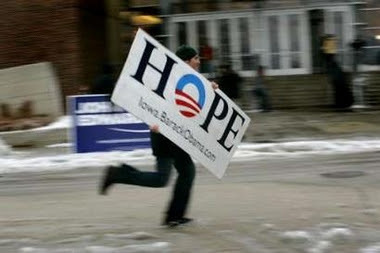 took their Hope for America Tour to Des Moines, Iowa today. It still amazes that the media and political elites still don't get what a huge story this is. They continue dismissing Barack as a novelty. Oprah's entry has gotten their attention with her added star power, but again, it seems to me that they're seeing the tour as a short-lived act. Nothing to worry about. Meanwhile, the elites are weary that their candidates--Romney/Clinton/Giuliani--may be upended by The People. The people seem to prefer Obama and Huckabee. I say, Power to the People! Check out this video from PERUANISTA in which Picataway Chief Billy Gregory Tayac welcomes indigenous immigrants as brothers. Illegals? The real "illegal aliens" first arrived 350 years ago from across Atlantic. The Chief also says that the arrival of indigenous Central and South Americans fulfills a native American prophesy. Provocative. 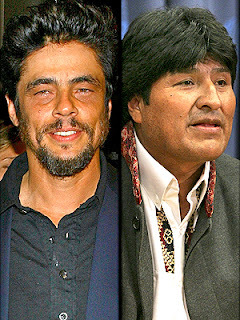 Benicio del Toro recently met with Bolivian President Evo Morales to talk about his new films that deal with Che Guevara: Guerrilla and The Argentine. Benecio is a Puerto Rican born actor best known for his Oscar winning performance in the movie Traffic. U.S. Senator Barack Obama has pulled ahead in the race for Iowa's Democratic presidential caucuses, while the party's national frontrunner Hillary Clinton has slipped to second in the leadoff nominating state, according to The Des Moines Register's new Iowa Poll. 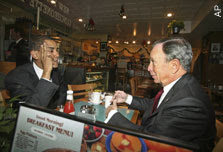 Obama and Bloomberg: Eggs and Toast? Mayor Michael Bloomberg had breakfast with Democratic Presidential hopeful U.S. Senator Barack Obama today. Nothing unusual except that the private meeting was very public, the media was alerted, Hillary's camp was kept in the dark, and it took place just a few blocks from Hillary's campaign HQ. Wow! The Clintonistas have got to be concerned. It's one thing worrying about a possible 3rd party presidential bid by the liberal NYC mayor, but it's quite another to have Bloomberg working in cahoots with your main primary opponent. Of course, it could have just been two pols having breakfast. NOT!!! Or Bloomberg just being friendly to a competitor he's about crush as he powers up the Independent Bloomberg for President battle fleet. May be. Or Bloomberg and Obama feeling each other out for the VP slots in their respective campaigns. Who knows. Bottom line? It ain't good news for Madam Hillary. Barack Obama was in Harlem--turf which the pundits ridiculously tag as Hillary's. But politics 101 dictates that you invade a competitor's turf only when there's a very high chance of winning there. Polls showing lots of Black love for Hillary, and Charlie Rangel's preferences aside, my money is on Barack to win in Harlem. And believe you me, it's not a racial thing. Here's a short video by VideoDog/Salon of Obama's sold-out visit to Harlem's famed Apollo Theater.